Ready for the best solution to missing teeth? At our practice in Nashville, we’ll perform every step of the implant process in one convenient location. In some cases, Dr. Fleming will recommend one or more supplemental procedures to prepare the patient for the dental implant process. The first step towards your new smile is scheduling your initial consultation. One of our highly-qualified implant dentists, Dr. Elam, Dr. Fleming, or Dr. Vaughan, will perform a comprehensive oral health evaluation, checking your jawbone density and the state of your gum tissue to determine if you’re ready for dental implants. In some cases, supplemental procedures such as bone grafting or gum augmentation will be necessary to prepare the patient for implant surgery. The next step is for our dentist to place your dental implants. The procedure involves creating a small hole to insert the titanium implant fixture into the jawbone. We do everything we can to make the procedure as painless as possible, but sedation is available if you request it. 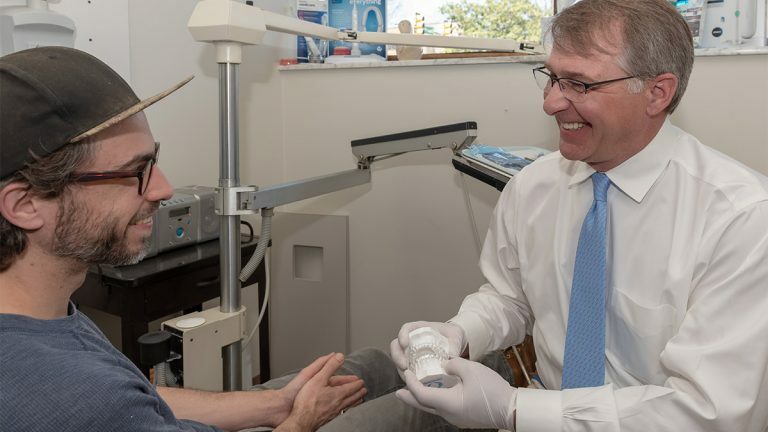 Once the implant fixture is fully acclimated to your smile, our implant dentist will place the abutment (a connecting piece that goes in the middle) and your attractive new prosthetic crown. Now you’ll be ready to face the world with confidence in your new smile.